Will populism trump power politics? On May 12, just weeks before Democrats and Republicans in Virginia will vote in primaries for governor, lieutenant governor and attorney general, Thomas Farrell, the head of Dominion Energy, Inc. sent a letter to its 76,000 current and retired employees and shareholders in Virginia. The letter was about one issue — Dominion’s effort to build a controversial 550-mile natural gas pipeline through West Virginia, Virginia and North Carolina. Farrell called the Atlantic Coast Pipeline (ACP) “one of the largest and most important projects” the utility has ever initiated. The project, led by Dominion, is a joint venture with three other energy companies — Duke Energy, Piedmont Natural Gas and Southern Company Gas. He urged voters to “review” the candidates’ positions on the ACP before casting their ballots in the Virginia primary on June 13. Opponents in Virginia — including grassroots and national environmental groups like the Virginia chapter of the Sierra Club — have charged that the pipeline is not needed, will harm environmentally sensitive areas, jeopardize water quality, and will make consumers pay the bill for the project in the form of rate hikes. While the pipeline will create thousands of temporary construction jobs, Dominion’s own projections estimate the project will create fewer than 300 permanent jobs — including 39 in Virginia. Despite the controversy, current Virginia governor Terry McAuliffe (D) has strongly endorsed the pipeline, which also has the backing of the Trump administration. But the upcoming Virginia election may threaten state support for the massive project. That’s important. While federal agencies primarily oversee interstate pipelines, state regulators play a crucial role. For example, the Virginia Department of Environmental Quality (DEQ) has the authority to determine whether the pipeline and its construction will degrade water quality in the state. State regulators could potentially delay or even block the project if its impact on water quality was serious enough. So it’s not surprising that Dominion would be paying a lot of attention to state politics. The Farrell letter was an additional salvo in an ongoing fusillade by Dominion to win final approval for the pipeline. 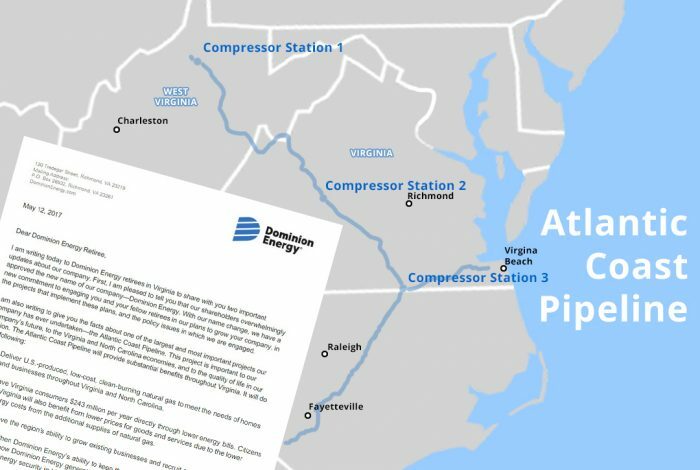 A recent report from a nonprofit, nonpartisan research group documents how Dominion has used political contributions and lobbying prowess to promote its pipeline plans. • Dominion Energy has given more than $10 million to Virginia candidates over the past decade. The contributions were almost evenly split among Republicans and Democrats. These contributions make Dominion a major player in the state, unrivaled in its “wide-ranging influence and impact on Virginia politics and government,” said Larry Sabato, a University of Virginia political science professor and longtime observer of state and federal politics. • McAuliffe and his political action committee received $60,000 from Dominion, and his 2013 inaugural committee received $50,000. (Virginia governors are limited to one four-year term). • In addition, CEO Farrell has personally given Virginia candidates more than $600,000 over the past decade, most of his donations going to Republicans. 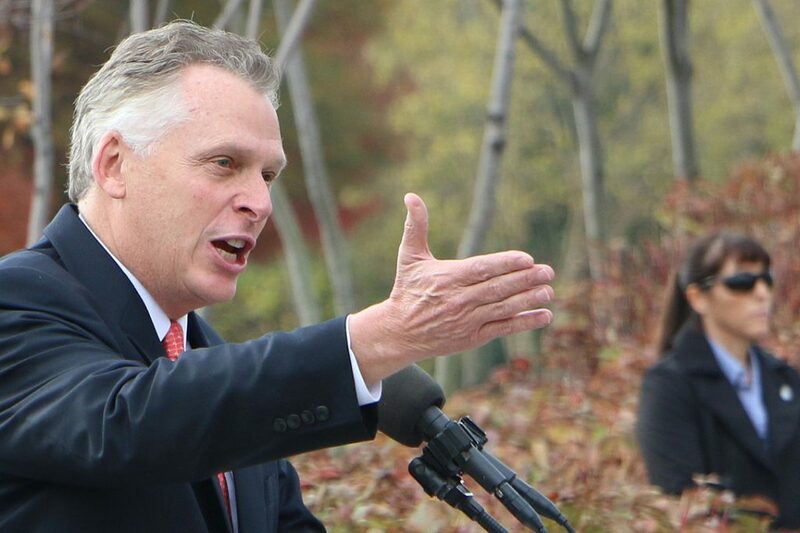 McAuliffe, however, received $7,500 from Farrell. • Dominion also has hired former state and federal regulators as corporate lobbyists. The most high-profile hire was Laura Vaught, who until this January was a senior policy adviser at the Environmental Protection Agency. Vaught now is lobbying for the pipeline, although her lobby reports indicate that she is not pressing her former agency. However, Vaught has reported contacts with other federal agencies that will have a lot of power over the pipeline’s final approval. Farrell’s letter, Holman said, could carry a lot of weight among Dominion employees or retirees. It sends a clear message of how to vote. When a letter like this comes from “higher management,” he added, “it’s almost a threat” to workers. Dominion’s efforts seem to have borne fruit. The Federal Energy Regulatory Commission’s (FERC) draft review, released last December, was favorable. FERC deemed the Atlantic Coast Pipeline’s environmental impacts “minimal” and able to be “mitigated.” FERC is expected to issue its final environmental assessment in July. State regulators also appear to be standing down. In April, the state DEQ announced it would scrutinize the pipeline’s impact on every stream and waterway affected by the project. Environmental advocates praised that decision, viewing it as a step in the right direction, and the only way to ensure that the project does not harm Virginia’s water quality, a threshold they insist the ACP cannot meet. But late last month, the DEQ appeared to flip-flop, saying that it would largely be relying on a less stringent federal assessment when determining the pipeline’s impact on water quality in the state. The DEQ denied it had changed its mind, blaming it on a miscommunication, stating that an agency spokesman had not been briefed by technical staff about what the agency had always intended to do. Groups opposing the pipeline have long insisted that Dominion has not disclosed its specific plans for building the pipeline or for addressing the challenges of trying to lay the pipeline in very steep, environmentally sensitive terrain. “This is the largest project [for Virginia] since the interstate highways and we have not seen the details,” Webb said. It is understandable that Dominion may want to move swiftly. Anti-corporate populism is growing among voters in both parties in the state. Dominion has become a symbol for overweening corporate power in Virginia. Indeed, the corporation is so powerful that independence from Dominion has become a populist rallying cry for 61 Democratic candidates for the state House of Delegates, who have pledged not to accept Dominion money for their campaigns. 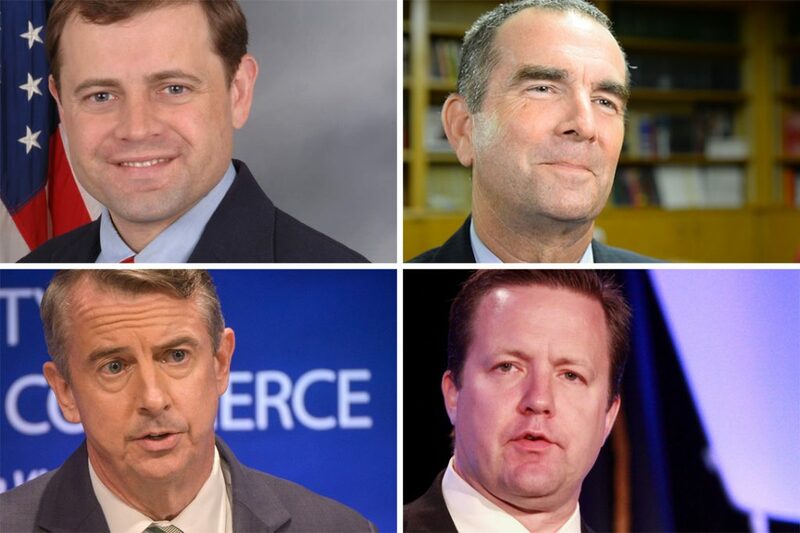 All three Democratic contenders for lieutenant governor also are refusing Dominion donations. Dominion also is becoming a major issue in this year’s race for governor. The highest profile candidate to refuse Dominion dollars is former Democratic Congressman Tom Perriello, who is running against Lieutenant Governor Ralph Northam in a hotly contested primary race for the Democratic nomination for governor. Perriello opposes the ACP, and has attacked Northam for accepting Dominion money. This year alone, Northam has pulled in more than $20,000 from Dominion, its board members and its lobbyists; over his career Northam has received more than $100,000 from Dominion. He also owns Dominion stock. Northam has not taken a position on the pipeline, except to insist that it must meet stringent environmental standards. Republican frontrunner Ed Gillespie has accepted about $43,000 in Dominion donations, and strongly endorses the pipeline. Corey Stewart, a Trump stalwart, and chair of the Prince William County Board of Supervisors, is running against Gillespie in the primary and has refused Dominion donations. Stewart has attacked the utility for being a bad corporate citizen. His beef with the corporation is about private property rights. He objects to Dominion’s use of federal eminent domain law to take private land, but states that he does not oppose the pipeline itself, just Dominion’s tactics. 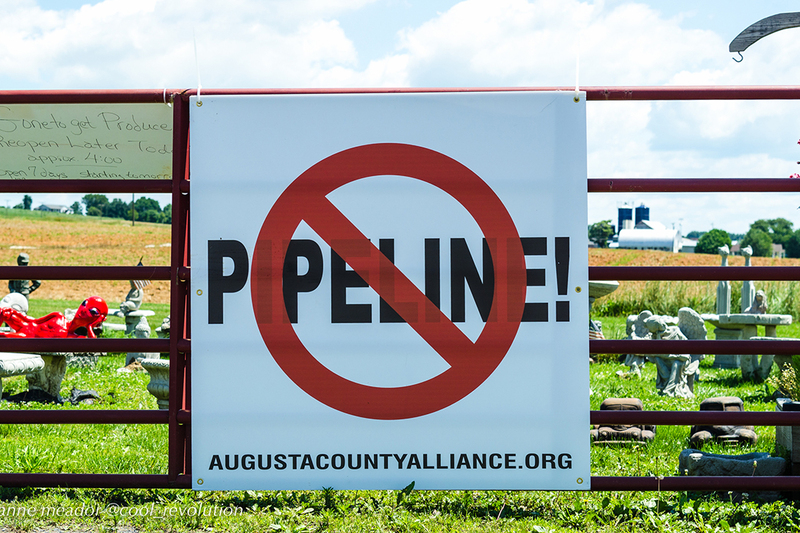 If Dominion fails to get the pipeline approved, it won’t be for lack of trying. When report author Derek Seidman started digging into Dominion’s efforts for the Public Accountability Initiative, the nonprofit corporate-watchdog group that did the pipeline study, he was stunned by the utility’s show of force. The study did not find that Dominion was doing “anything illegal. But the ways it has used its power and influence to advance the pipeline are all hidden in plain sight,” Seidman said, referring to Dominion’s substantial political giving, hiring of influential lobbyists, community involvement and corporate support for nonprofit groups, public relations efforts, and its relationships with other major corporations in the state. Related front page panorama photo credit: Adapted by WhoWhatWhy from sign (Mark Goebel / Flickr – CC BY 2.0) and map (Theshibboleth / Wikimedia – CC BY-SA 3.0).